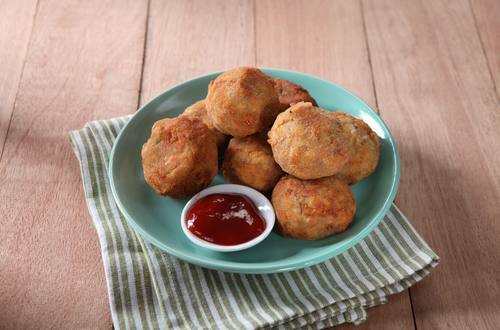 Here's a fun way to eat vegetables, Banana Heart Balls it is! Knorr Pork Broth Cubes it can simply add life to the simplest of dish. 1 Begin by getting a bowl, and combine rock salt and banana heart. Leave this for 10 minutes. Wash and squeeze well and repeat the process 2 - 3 times. 2 Get another bowl, and combine the eggs, banana heart, garlic, onions, carrots, dissolved Knorr Pork Cubes and 2 tbsp flour. Mix this well and shape into balls. 3 Prepare 3 shallow trays for flour, egg and breadcrumb mixture. Coat the banana heart balls in flour, dip it in beaten egg before rolling it in breadcrumbs. 4 Fry the banana balls in a preheated pan filled with cooking oil and cook until brown in color. Get ready to taste and pair this with your favourite condiment of ketchup or sweet chili sauce. You will just love how delicious and healthy this dish is.